Don’t be fooled by the title of this post. I didn’t accidentally cut myself as I worked, or anything in that vein. My result here was a happy accident, or perhaps discovery would be a better word, and the blood comes from the blood oranges that I used. There are several varieties of blood oranges and some are more red on the inside than others. The ones I used for juice here were nearly black, resulting in this delightfully colored jelly. Other blood oranges will work perfectly well, but the result will probably be more orange than pink. This jelly came about because I wanted to make a blood orange version of Donna Hay’s lemon souffles, which I have made in a lime version already. For the souffle base, citrus juice is cooked with sugar and thickened with cornstarch. The mixture chills in the refrigerator before being folded into egg whites and baked. The blood orange base seemed to thicken more than the lime base, possibly due to the presence of more natural sugars in the orange itself. It was firm and silky smooth after a few hours in the refrigerator. I dipped a knife into it and felt a remarkably jelly-like texture. To test it, I spread it onto a few crackers and then I decided that I didn’t need to make a souffle after all. I really liked this as a jelly/jam. It was sweet, with a slight zing from the citric acid in the orange juice. The little crackers in the photo are appetizer crackers that I picked up at Trader Joe’s, but this was really best on toast. After about a week in the fridge, the leftovers seemed to separate a bit, so I recommend using this within a few days. This is, in my opinion, a small price to pay for something that tastes so good. And a few more pieces of toast and jam never hurt anyone. Besides, you can always make a souffle with the leftovers. In a medium saucepan, whisk together orange juice, water and sugar. Bring to a boil. Meanwhile, thoroughly combine cornstarch with 2 tablespoons of water in a small bowl. Whisking constantly, pour cornstarch mixture into orange syrup and continue cooking for about 2-3 minutes, until thickened. Transfer to a bowl, cover with plastic wrap and refrigerate until cool and set. Store in the refrigerator. To make souffles, use 1/2 recipe. I can’t keep up with all the wonders that you make. I particularly like this post due to how the ending use of the recipe came about. I love blood orange but can’t find it easily where I live. I know for instance that at the moment they can only be found in one of the big supermarkets in my area. my local market has had none yet. This is so beautiful. Do you think it could be adapted to the really red grapefruit I have in my garden? Either as a jam or souffle? We shall call it a very happy accident! This looks delicious and now that blood oranges are more readily available here I’ll have to give this a try … great post as always! 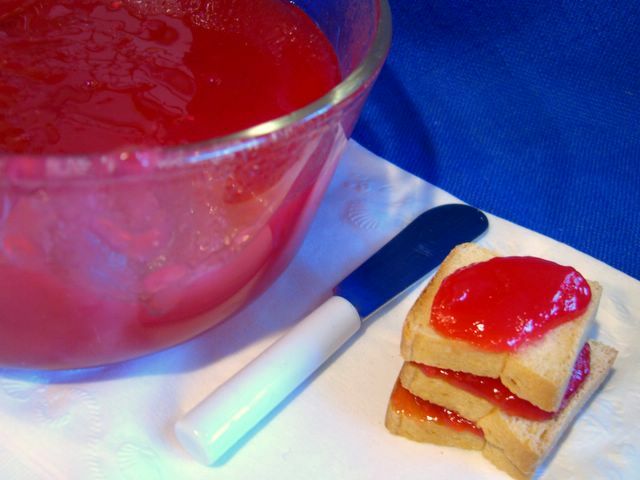 I tried this recipe as written and unfortunately the jelly never set up. I added a packet of liquid fruit pectin and it worked fine.